Here, our highly-qualified team will tackle everything from germs to gym etiquette. If you’re fitness focused and curious about the world around you, please subscribe to The Plex Fitness Report! Pregnancy is exhilarating, exciting, and life-changing. You might be flaunting glowing skin, great hair, and loads of energy. On the other hand, it is also exhausting, stressful, and scary. The miracle of life sometimes means Mommy is uncomfortable and dealing with heartburn, mood swings, and morning (er’ all-day) sickness. Things are swollen, hormones are causing acne in places, and the forgetfulness that is pregnancy-brain is inconveniencing daily life. It’s important to find support and friendship. Connecting and chatting with others who are going through the same thing as you can make you feel so much better about all the “extra” things that come along with pregnancy. The gym is a great place to do that! There are so many benefits to staying active throughout your pregnancy. Regular exercise during and after pregnancy can alleviate pain, improve posture, build the stamina needed for labor and delivery, and relieve stress. Doctors are increasingly encouraging women to exercise regularly, both during and after their pregnancies. Both pregnancy and the labor process take a lot out of you, so these exercises can help you keep your strength and endurance up to at least make the process a little easier! Don’t just take our word for it! Even the American College of Obstetricians and Gynecologists (ACOG) tote the benefits of exercise and a healthy lifestyle for pregnant women saying, “Women who begin their pregnancy with a healthy lifestyle (e.g., exercise, good nutrition, non-smoking) should be encouraged to maintain those healthy habits. Those who do not have healthy lifestyles should be encouraged to view the preconception period and pregnancy as opportunities to embrace healthier routines.” Additionally, “Pregnancy is an ideal time for behavior modification and for adopting a healthy lifestyle because of increased motivation and frequent access to medical supervision.” If you don’t have the healthiest lifestyle now, what better reason to start than having a little person inside you being dependent on your health? Don’t just start being healthy for yourself, do it for your baby too! The ACOG assures us that there is minimal risk in engaging in regular exercise during pregnancy. They actually found that it improves or maintains physical fitness, helps with weight management, reduces the risk of gestational diabetes in obese women, and enhances psychological well-being! All workouts, including ones for those who are expecting, should include aerobic or cardio work, strength training, and stretching. 1. Strengthening your three-dimensional core musculature to help keep the lumbopelvic complex from making postural shifts that lead to pain. Incorporate exercises like the wood chop or the side plank. 2. Focus on the posterior chain to counteract all the added weight on the front of the body. Strengthen the upper back and glutes, as well as mobilize the lower back. Bent over rows, glute bridges, and cat-cow yoga poses are a few exercises you can incorporate to address those issues. 3. Babies in utero can drop the pelvic floor up to an inch, so it is important to make sure your body is strong and prepared. Kegel exercises to strengthen the pelvic floor are recommended before, during, and after pregnancy. Focus on contraction and active relaxation of these muscles. If you would like some guidance and support, come join our Prenatal Fitness Group X class! We are now offering a class that is made just for our expecting mommies! In this class we will start out with cardio to warm up for strength training with both body weight and free-weights and then move on to mobility and stability exercises. It’s the perfect class to help relieve those aches and pains pregnancy can cause while strengthening the body and keeping both mommy and baby healthy! Come hydrated, dressed comfortably, and ready to move! Consult your physician or OB-GYN before beginning any new workout regimen. We will have a short prenatal information form for you to fill out as well in order to ensure we offer you attentive care during the class. Pregnant women who have experienced vaginal bleeding, premature rupture of membranes, or are at risk for preterm labor should not engage in exercise and will not be able to participate in this class. Carmen is a Certified Personal Trainer through the American Council on Exercise and holds a specialty in Prenatal/Postnatal Fitness. 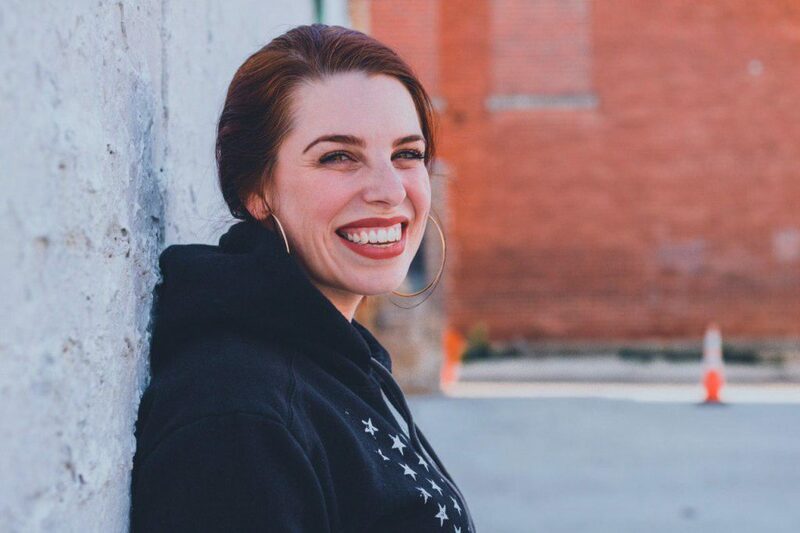 She’s a mother of two herself, and has a passion for helping people. 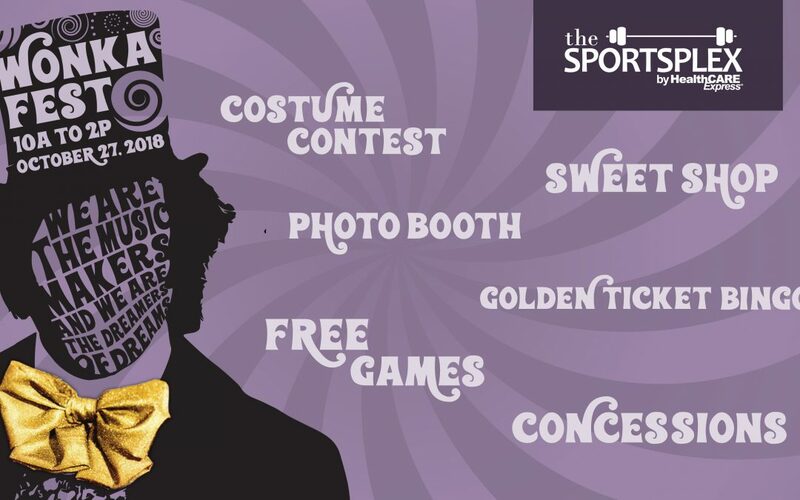 We will be hosting a scrumdiddlyumptious Willy Wonka themed fall festival, WonkaFest, Saturday, October 27 from 10:00 am to 2:00 pm at The Sportsplex! WonkaFest is a free event the whole family will enjoy. There will be several fun activities for everyone to participate in, concession stands, vendor booths from local and area businesses, and a sweet shop. There will be a costume contest at the beginning of the event, starting at 10:00 am. There will be three categories: 0-3 years old, 4-12 years old, and family/group (three or more people). The first-place winner in each category will receive a cash prize of $100! Several other carnival-style games will be available for children to play. Winning the games will give players a chance of either winning a prize or a mark towards receiving a Golden Ticket. Golden tickets can be redeemed for BINGO cards. Several fabulous prizes will be available for those participating in the BINGO game from designer bags, to bicycles, and more! There will also be a sweet shop set up in the Klondike Academy daycare center where attendees can purchase confections from local bakers and confectioners or fill grab-bags with free candy and sweets. All proceeds will be donated to benefit Nash Elementary School. If anyone is interested in attending WonkaFest, you can RSVP on the event on The Plex’s Facebook page. This is going to be a fun event, and we can’t wait to see everyone there! Interested in becoming a vendor at this event? Contact Suki O’Neal at suki.oneal@healthcareexpress.com to find out how. Whether you’re a business owner or employee, we’re offering a $10 discount for corporate gym memberships for businesses with 5 or more members at The Plex. If you enroll this month, you will receive your first month FREE and your second month half-off! If the gym you and your co-workers attend doesn’t offer these services, you might be in the wrong gym. So, why don’t you come give us a try? 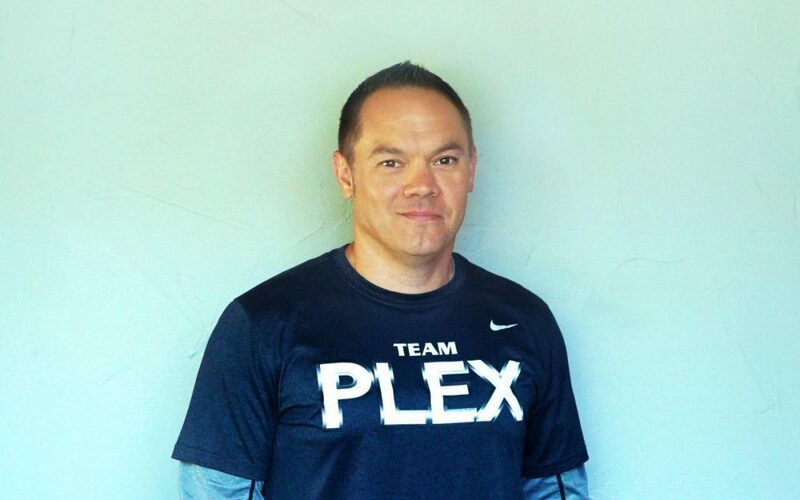 All of us here at The Plex are happy to announce that we have an amazing new Fitness Director. You know him, you love him, everyone give a big round of applause for Billy Creutz! We are so excited for Billy in his new position, and we know we’re going to go far under his leadership. We couldn’t have asked for a better person to fill the position than Billy. He is a powerhouse of ideas and energy, the perfect kind of person to take on the job. Nationally accredited with academic distinction by the National Academy of Sports Medicine, Billy has been serving the Four States area for 3 years as a personal trainer, group exercise instructor, and group fitness director. A 20-year Air Force veteran, Billy is no stranger to performance training and group exercise. After retiring from the Air Force and joining the Civilian Sector, Billy discovered that he could continue aiding people in pursuing their personal and professional fitness goals and was blessed to find a new home waiting for him at the Sportsplex. Billy is committed to developing and delivering a diverse catalog of the finest quality original group exercise content to our fitness family and the larger Four States area. So, everyone, if you see Billy, be sure to give him congratulations! It’s that time of year again… Summer! It’s already really hot out, so we’re sure you’re ready to make a splash out in the pool. Don’t know how to swim? Well, we’ve got that covered too! We’re about to start up this year’s swim lessons, taught by Collier Cordray. Collier has over three years of experience, so you or your kiddos will be in safe hands! Our lessons are available for anyone from ages three and up. We are offering both private and group lessons. Our group beginner lessons will be happening in the morning, while our group intermediate lessons will be held in the afternoon. For a private swim lesson, call us at 903-838-4697. Our private lessons are first come first serve, so you better act fast! 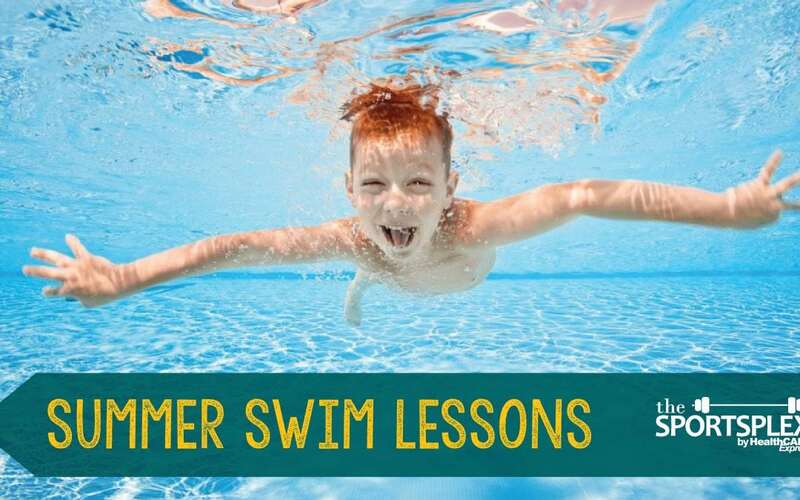 Students will learn basic swimming techniques such as proper swim form, how to hold breath underwater, how to control breathing while swimming, how to blow bubbles, and more! Our intermediate classes will focus on honing the skills mentioned above to help our students to become even better and stronger swimmers. Private lessons are $300 for members and $380 for non-members, while group lessons are $200 for members and $280 for members. 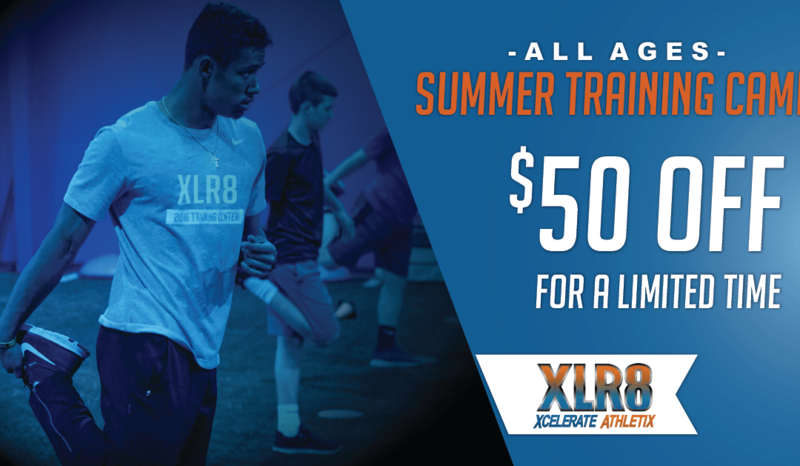 Sign Up for the Summer XLR8 Program by May 18 to receive $50 off! Are your young athletes ready to take athletics training to the next level? You don’t want your young sports stars to fall out of practice over the summer, and there’s no better way to keep them in tip top shape than enrolling them in the XLR8 summer program! XLR8 will strengthen the skills of the athletes enrolled and help them tap into potential that they didn’t even know was there. The summer open enrollment for classes will run through the end of May. Training will begin on June 4 and will continue until August 9. For students involved in football and volleyball, the training season is a bit shorter, ending on July 29 before the season begins at school. Training opportunities are available for every athlete from kindergarten to the professional level. They don’t have to be the best player, but they have to have the drive to get there! Students need to come and be prepared to be pushed to the limit so that they can surpass what they thought they were capable of. Classes run for an hour and are offered several times a week. Each class is broken down into age groups, so no one has to worry about being put in a group with athletes much older than them! Get yourself or your student athletes ready for the fall season by training with XLR8. Focus on increasing endurance, building strength, raising speed, and conditioning muscles, so that you or your athlete will be at peak performance at whatever sport is played. If you sign up by May 18, you will receive $50 off your registration! To register, or for more information, call John Clack at 903-908-7105 or Dave Welch at 903-733-7105. You can also check out the website here! This year, in observance of Every Kid Healthy Week, HealthCARE Express and The Sportsplex want to help celebrate and support sound nutrition, regular physical activity, and other health-promoting programs. What is Every Kid Healthy Week (EKHW)? EKHW is a weeklong national observance during the week of April 23-27 (So it’s coming soon!) created to bring health consciousness and awareness to the forefront of the minds of parents and children. EKHW focuses on improving health and wellness of children not only so that they can lead healthier and happier lives, but doing so also helps them become better prepared to learn in school! A healthy body equals a healthy mind, after all. HealthCARE Express and The Sportsplex will be hosting different events during the week, doing something special each day to bring attention to EKHW. Monday, April 23rd you can join HealthCARE Express and their lovable mascot, Klondike, as they go for a stroll around the park (will be specified what park when that info becomes available). Tuesday will follow with us hosting a family fitness night! Bring your whole family to The Plex and exercise together. Kids learn by example, so there’s no better way to let them know how to be healthy than by showing them! On Wednesday, (name of store) will be hosting a healthy snack taste testing event! Come and try out different fruits, vegetables, and other snacks to find healthy alternatives to food you and your children may be eating. Thursday will be the return of our successful, Yoga in the Park event out at Spring Lake Park! Come out with your children and learn how to do yoga together. Everyone there is of varying skill levels, so don’t worry about you or your children embarrassing yourselves. Finally, on Friday EKHW cumulates with us finishing the week off at (name of business) where you can bring your kids for a healthy and fun time! Along with these daily activities, we will also be posting daily challenges to our Facebook page, so be sure to check in every day to see what we will have going on! If you post pictures or videos of you and your family participating in these challenges you will be entered in a drawing for an awesome prize! Each day you participate counts as another entry, so participate in the challenges every day for better odds! Sounds fun, right? We can’t wait to see what you guys do to helps us celebrate this week! We here at The Plex would like to proudly introduce our OUTSTANDING Members of the Month: Michelle Haselow and Janice Norton! 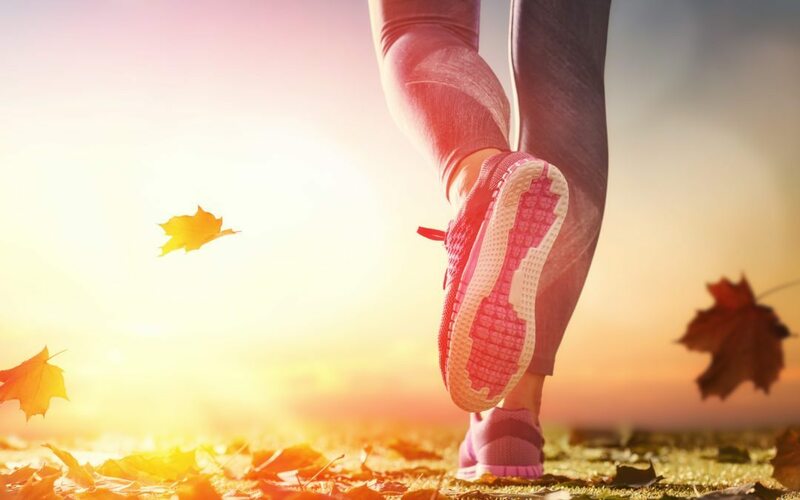 These lovely ladies can definitely serve as an inspiration to all of us, whether you are taking your first steps toward fitness, or you’re well on your way of your fitness journey. Watch this awesome video to hear their stories and why they decided to get fit. Who knows? Maybe you’ll learn a little something from them. Fall Into Fitness at The Plex! Most people tend to eat a lot during the holiday season, not to mention the tendency to slack off a bit on their workout regimens. You may indulge a bit in too many pieces of fun-sized candy bars at Halloween, too much turkey and dressing at Thanksgiving, or too many cookies or pieces of pie at Christmas, but luckily The Plex is here with an awesome deal to help you keep off those holiday pounds! We’re offering a great deal for the next three months for this exact reason. What is this amazing deal, you ask? Well, we’re grouping together three months’ worth of membership fees at a discounted rate so you can hit the gym and fall into fitness. Pay only $99 for a single membership, $199 for a couple’s membership, and $299 for a family membership (minimum of three people and a max of five). These prices are for the entire three months, lasting for a full 90 days after you register. You can register for this special between now and the end of October, and while that seems like a long time from now, the days will go by quickly! Sign up as soon as possible and get to work on improving your health and working toward making a better you. For more information, call The Sportsplex at 903-838-4697, or drop by in person at 5610 Richmond Rd., Texarkana, TX 75503. We all know that the gym is a place to keep your body fit and healthy. But what most of us don’t know is how many germs are floating around while you’re working out. Do you know what the top 9 most germy areas are at the gym? If not, you’re in luck because we are here to tell you what they are and how to avoid the germs. Cardio equipment includes treadmills, ellipticals, stairmaster, and anything else that gets your heart pumping. Because these machines are so frequently used, they accumulate a lot of sweat and germs. Be sure to always wipe down the equipment with a sanitized wipe before and after use. This will remove the germs and sweat left by the person before you, and remove yours for the person after you. Also be sure to rinse off after your dip in the pool. If you like to watch TV or listen to the radio at the gym, you are probably using the channel controller that is attached to certain equipment. Because of the frequent use of these, they carry a lot of germs. 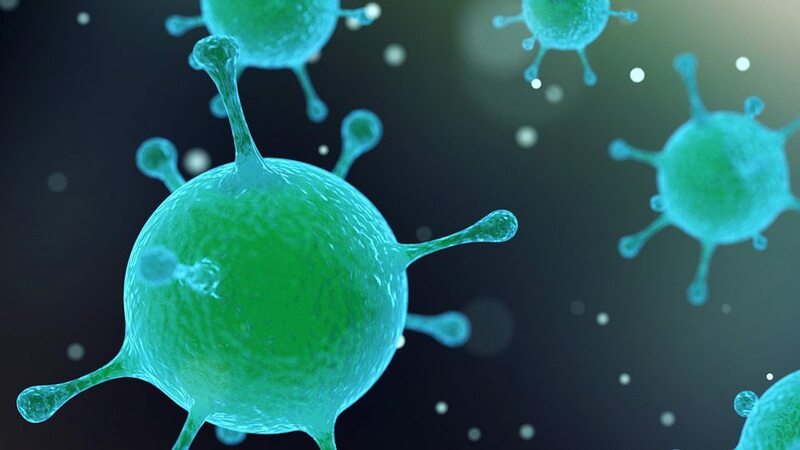 To avoid these germs, be sure to wipe down the device before and after you use the equipment. Whether you’re taking a yoga class or spinning, the room still has germs floating around from the class before you. Be sure to bring your own mat to classes, to avoid laying on germs. If you don’t have your own mat, lay a towel down between you and the mat. And as always, be sure to wipe your equipment down before and after your class. After a hard workout we know that you want a nice shower and change of clothes, but be sure to know your surrounding in the locker room. Just like you, others are sweating and sitting down on the benches. If you sit on the benches in the locker room, always be fully clothed to keep your skin away from germs left behind. We know that everyone lifts different size weights, so we also know that the weight changing levers on machines are frequently used. Coming in at number five most germy on our list, we want to remind you to always wipe down the lever before and after you use it. Sports activity equipment are things like yoga balls. Because of their frequent use at The Sportsplex, we want to be sure they are as clean as possible. To keep you as healthy as possible, we recommend not touching your face until after you have washed your hands. Free weights are things like dumbbells and kettlebells. Dumbbells are one of the most used items in the gym so they get a lot of germs throughout the day. After your use of free weights be sure to wash your hands before touching your face or mouth. Water fountains rank as number 1 most germy in the gym. From the spout that the water comes out of, to the handle you press, they are germ central. To avoid these germs at all cost, be sure to bring a water bottle to the gym with you. If you need to use the water fountain be sure to wipe the handle and spout before using. Our number one focus here at The Sportsplex is to keep you healthy. That includes everything to making sure your equipment is working, to making sure it is clean. Your use of these simple tips will help keep you healthy and in the gym everyday, because sick days just aren’t in the workout plan.